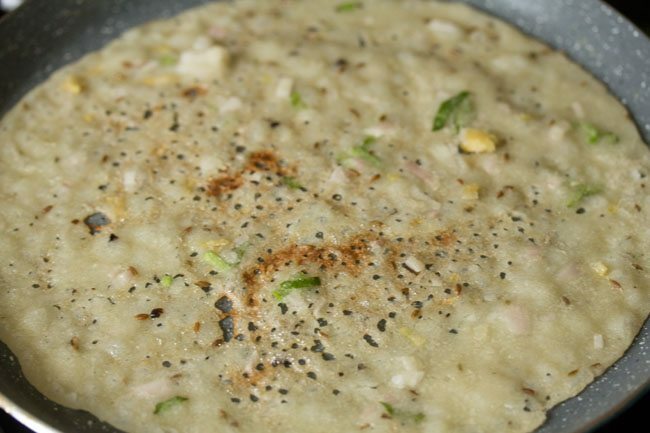 butter rava dosa is a variation of the popular rava dosa made with butter. butter rava dosa recipe with step by step photos – a delicious variation of the popular rava dosa made with butter. butter rava dosa is also served in many restaurants. 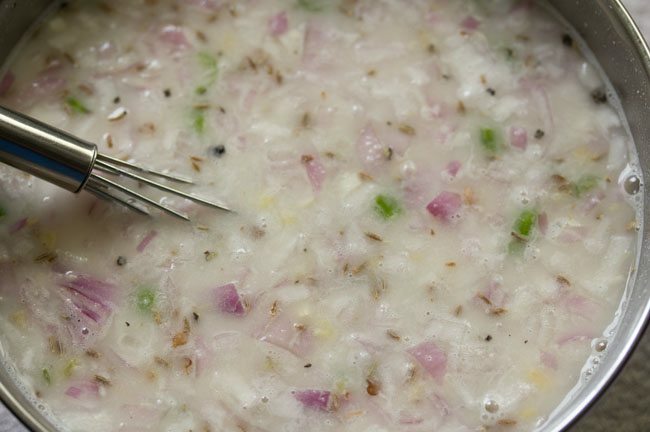 another variation of rava dosa is this onion rava dosa which i have already shared. 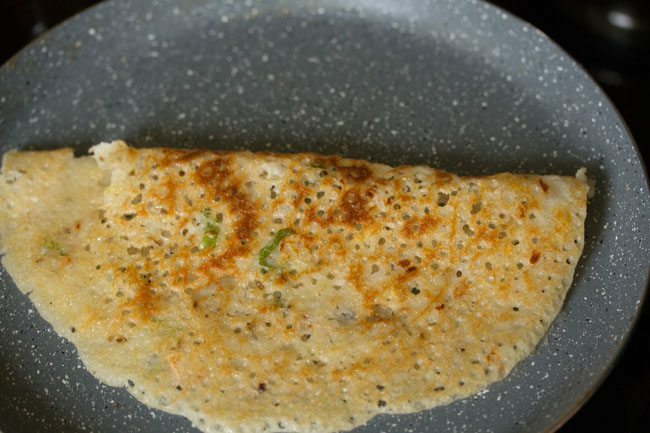 rava dosa is one of those easy to prepare breakfasts that anyone can make. 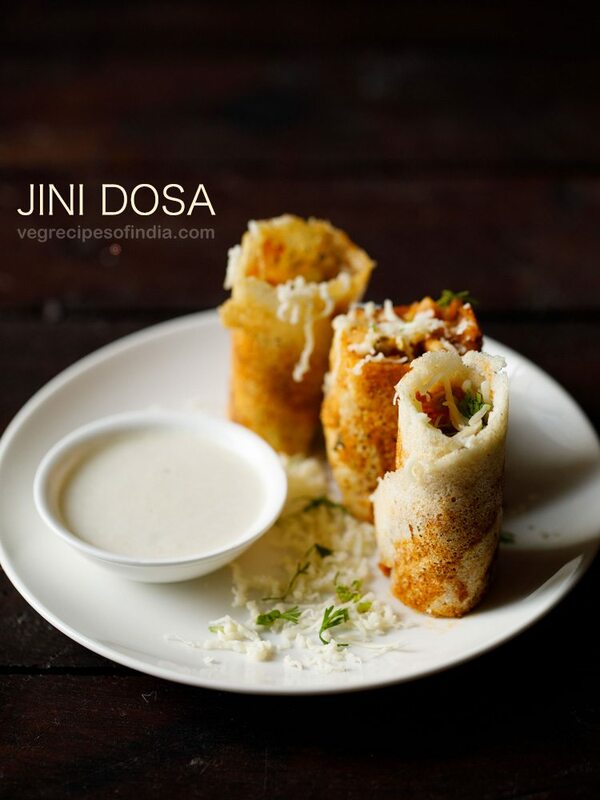 these crisp buttery dosas tastes good and are simple enough to prepare. in this recipe, butter is used instead of oil. you can use both salted butter or unsalted butter. but salted butter tastes better. 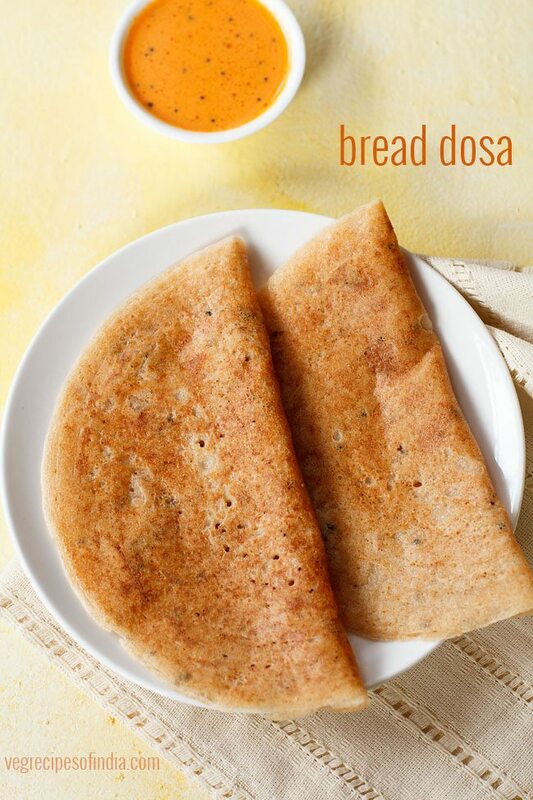 the flavor of the butter makes a lot of difference to these crisp dosas. you can also use ghee instead of butter. 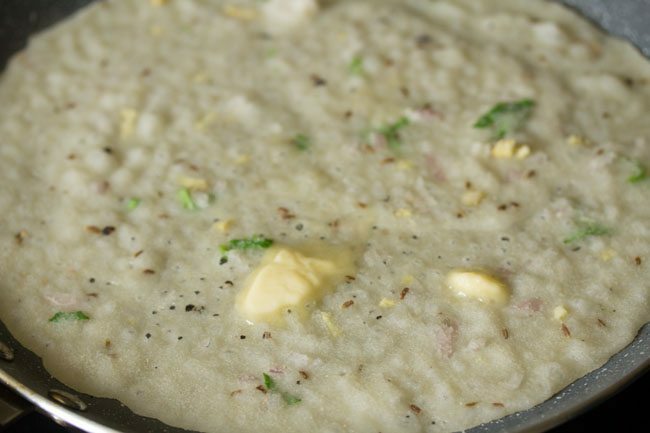 when preparing instant rava dosa with butter, a few things to keep in mind. firstly when adding butter, the tawa or pan should not be too hot. the butter should just melt and not get browned or burned. so when adding butter, keep the flame to a medium-low or medium flame. then pour the dosa batter and then increase the flame to medium or medium-high. 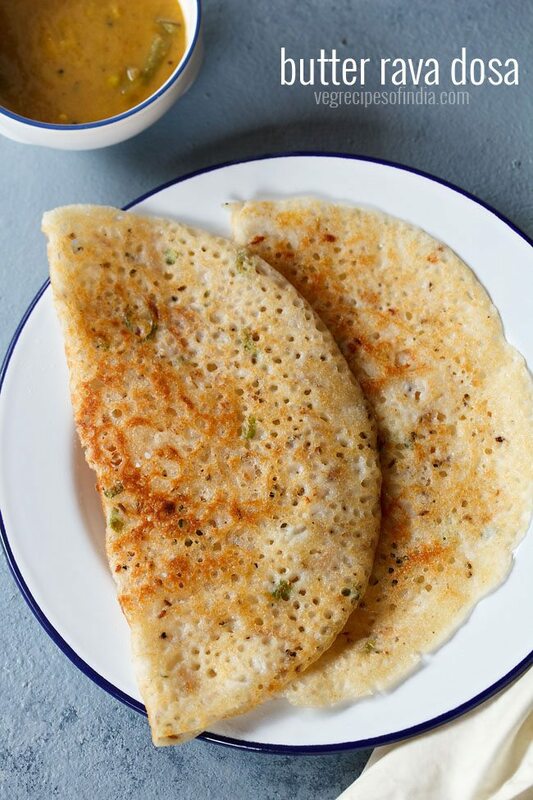 serve butter rava dosa with coconut chutney or sambar. masala dosa recipe restaurant style. 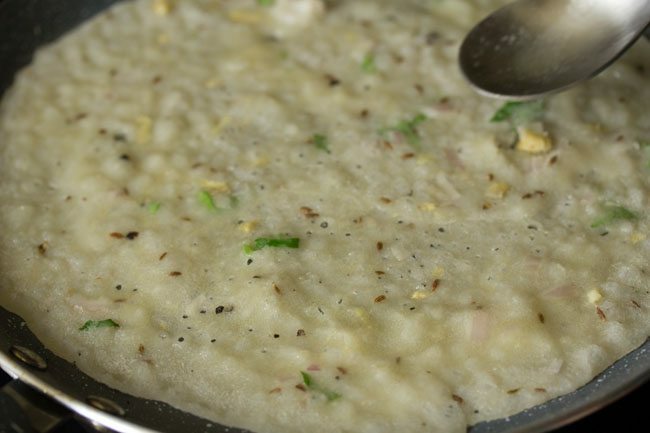 take ½ cup unroasted fine rava, ½ cup rice flour and ¼ cup maida in a bowl. 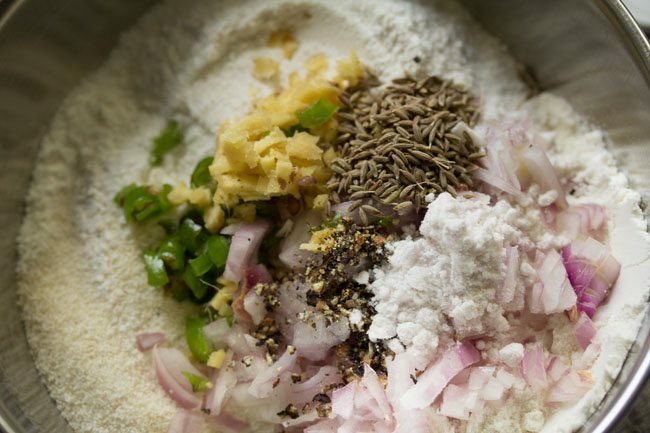 then add ⅓ cup chopped onions, 1 or 2 green chilies (chopped), ½ inch ginger (chopped), ½ tsp crushed black pepper, ½ tsp cumin seeds (jeera), 8 to 10 curry leaves (chopped) and salt as required. add 2 cups water. 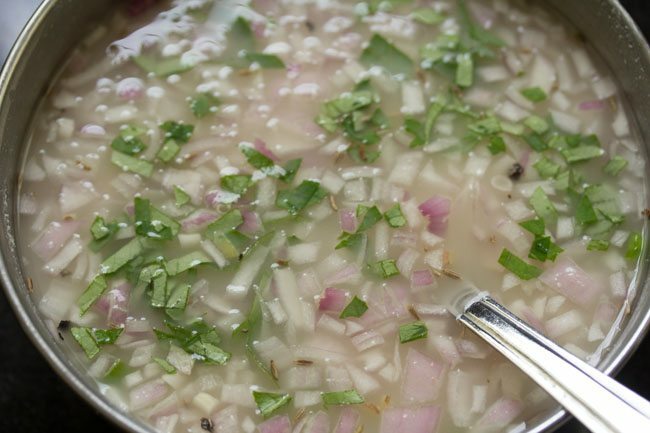 depending on the quality of rava (sooji), you can add less or more water - from 1.5 to 2.5 cups water. i added 2 cups water. whisk till smooth without any lumps. the batter has to be flowing and thin. if the batter looks thick or has a medium consistency, then add more water. 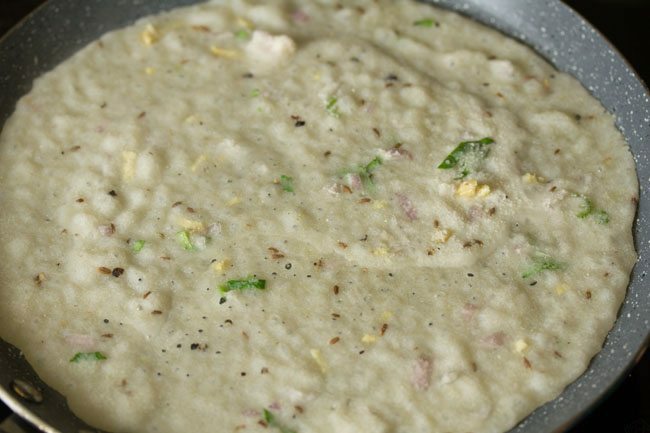 if the batter looks very thin and runny, then add some rice flour. cover and let the batter rest for 30 minutes. once the batter rests, you will see that the rava and the flours have settled down and the water will be floating on top. 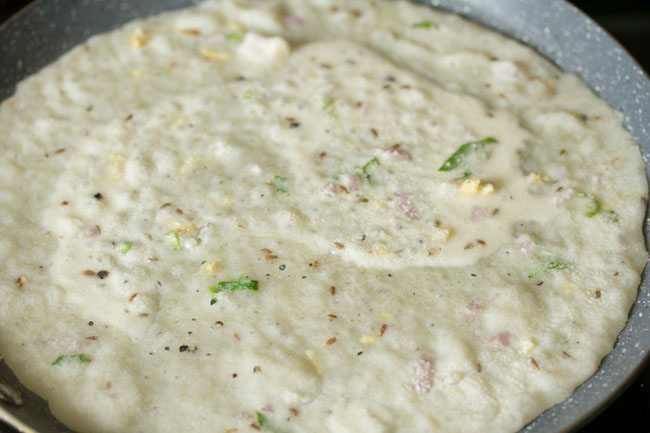 before preparing dosas, mix the batter very well. spread some butter on the tawa. do make sure that the tawa is on medium-low to medium flame, so that the butter does not burn or get browned. with a ladle pour the dosa batter from some height. start from the edges move towards the centre. if there are big or small gaps, then fill them lightly with the batter. increase the flame to medium or medium-high and cook the dosa. when the top side looks cooked, then sprinkle ½ to 1 teaspoon butter on the top and sides. 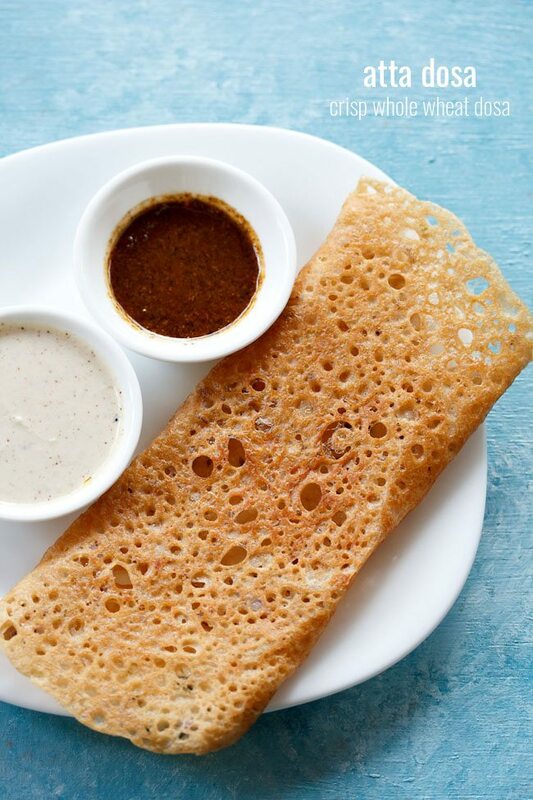 spread butter all over the rava dosa with a spoon. 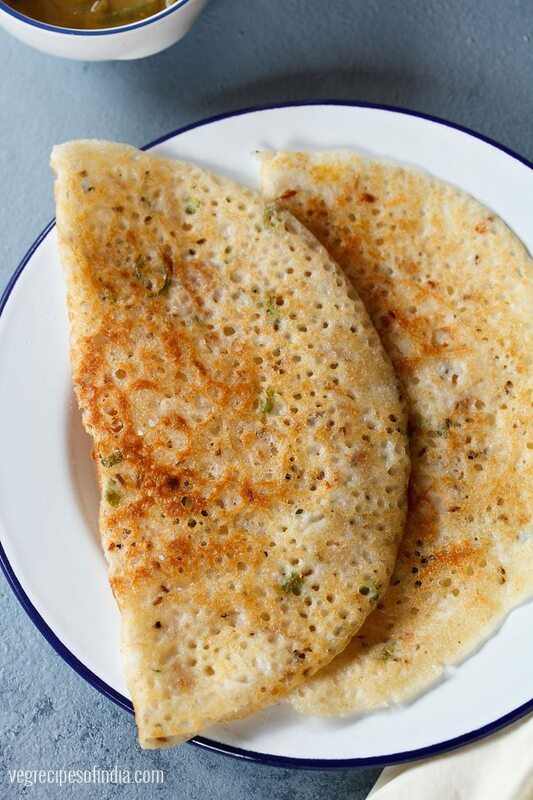 these instant butter rava dosa takes a little longer time to cook than regular dosa. cook till the base is golden and crisp. the more you cook the dosas and the more golden it becomes, the more crisp it will be. you can even cook both the sides if you want. 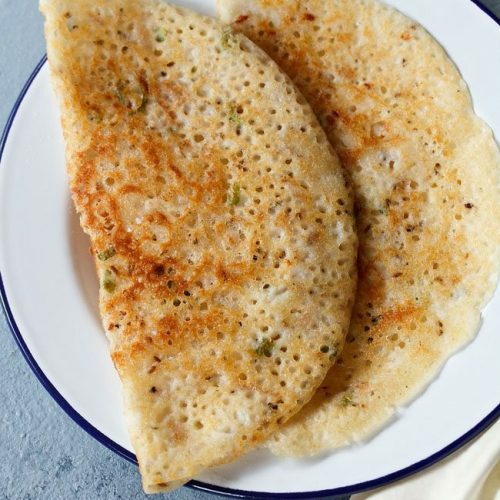 fold and then serve butter rava dosa hot with coconut chutney and sambar. the flours settles down at the bottom of the batter. 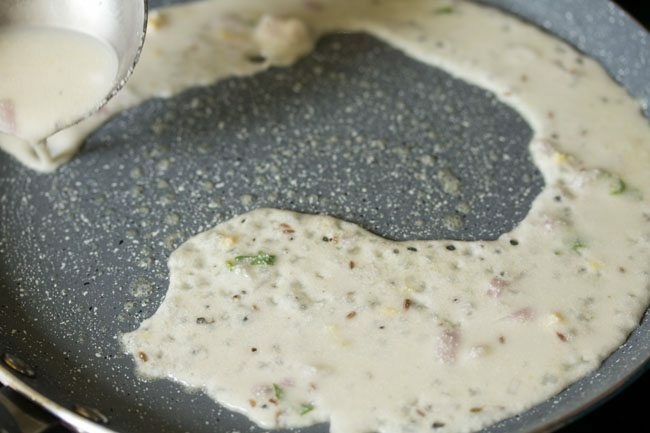 so you have to stir and mix the batter very well every time you make dosa. in case the batter becomes thick after making a few rava dosas, then add some water and stir again. 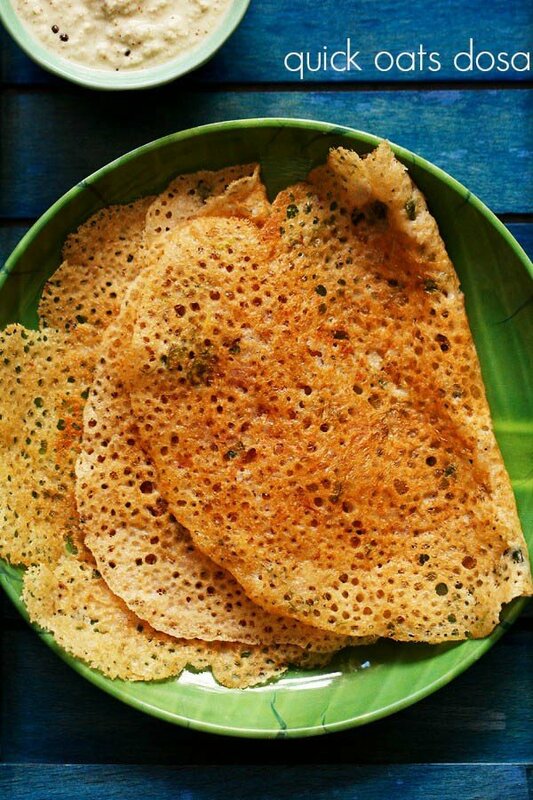 serve instant rava dosa with coconut chutney or dosa podi or sambar. 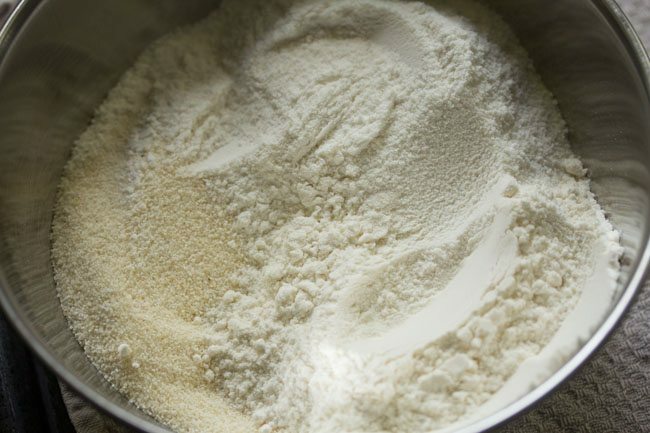 1. take ½ cup unroasted fine rava, ½ cup rice flour and ¼ cup maida (all purpose flour) in a bowl. instead of maida, you can also use whole wheat flour. 2. then add ⅓ cup chopped onions, 1 or 2 green chilies (chopped) and ½ inch ginger (chopped). 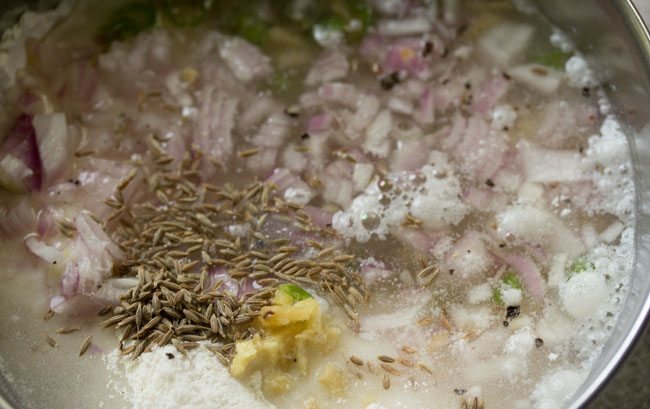 3. also add ½ teaspoon crushed black pepper, ½ teaspoon cumin seeds (jeera), 8 to 10 curry leaves (chopped) and salt as required. 4. add 2 cups water. depending on the quality of rava and sooji, you can add less or more water – from 1.5 to 2.5 cups water. i added 2 cups water. 5. whisk till smooth without any lumps. the batter has to be flowing and thin. if the batter looks thick or has a medium consistency, then add more water. 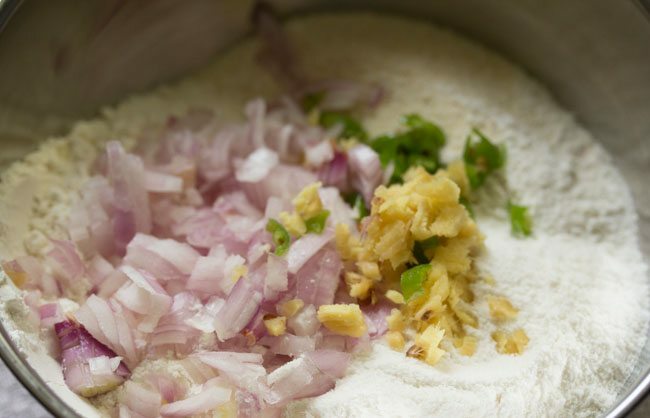 if the batter looks very thin and runny, then add some rice flour. 6. cover and let the batter rest for 30 minutes. once the batter rests, you will see that the rava and the flours have settled down and the water will be floating on top. 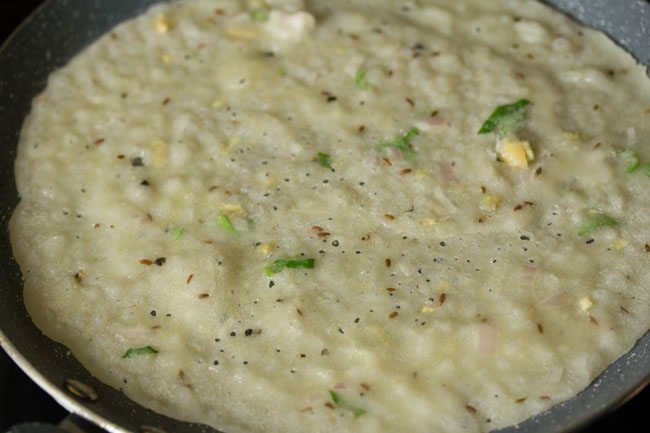 7. before preparing dosas, mix the batter very well. 8. spread some butter on the tawa. 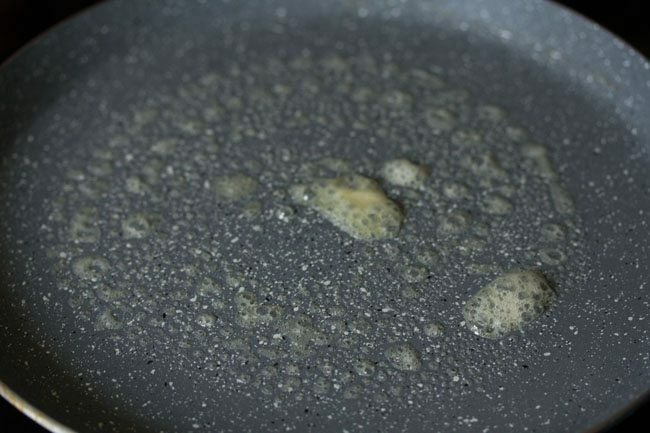 when spreading butter on tawa, keep the flame to a medium-low or medium, so that the butter does not burn or get browned. 9. with a ladle pour the dosa batter from some height. start from the edges move towards the centre. 10. if there are big or small gaps, then fill them lightly with the batter. 11. increase the flame to medium or medium-high and cook the dosa. 12. cook till the top side is done. 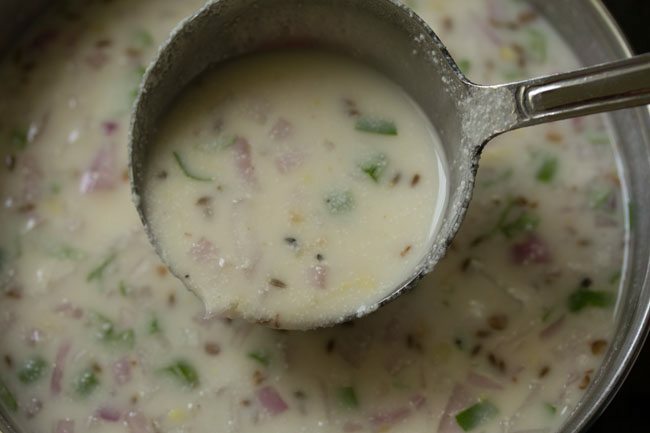 13. when the top side gets cooked, then add ½ to 1 teaspoon butter on the top and sides. 14. spread butter all over the rava dosa with a spoon. 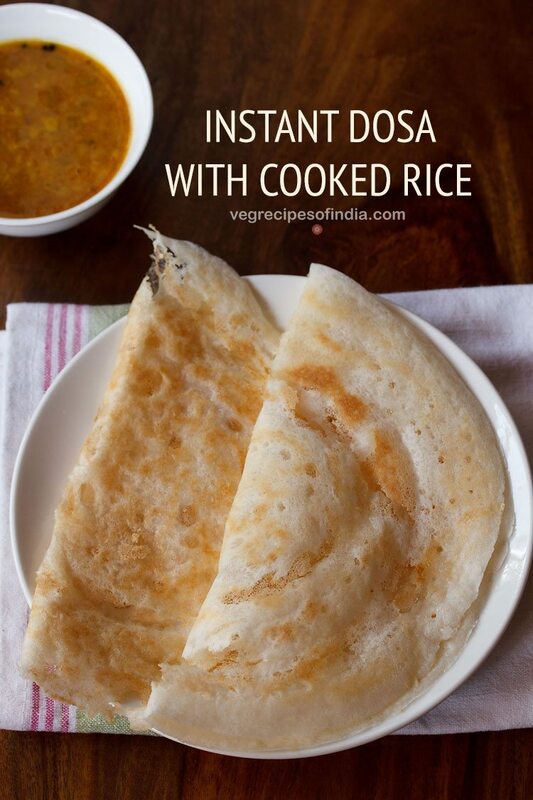 15. instant butter rava dosa takes a little longer time to cook than regular dosa. 16. cook till the base is golden and crisp. the more you cook the dosas and the more golden it becomes, the more crisp it will be. 17. the base should become golden and crisp. then fold and serve. if you want you can even cook both the sides. when preparing the next dosa, again reduce the flame to low-medium or medium and then spread butter. 18. fold and then serve instant butter rava dosa hot with coconut chutney and sambar. the flours settles down at the bottom of the batter. 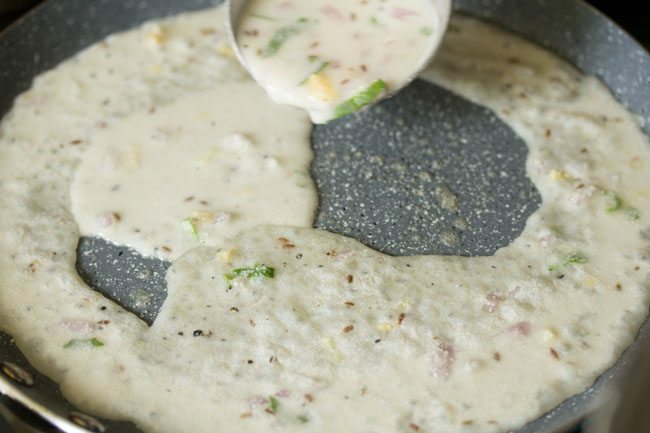 so you have to stir and mix the batter very well every time you make dosa. in case the batter becomes thick after making a few dosas, then add some water and stir again. 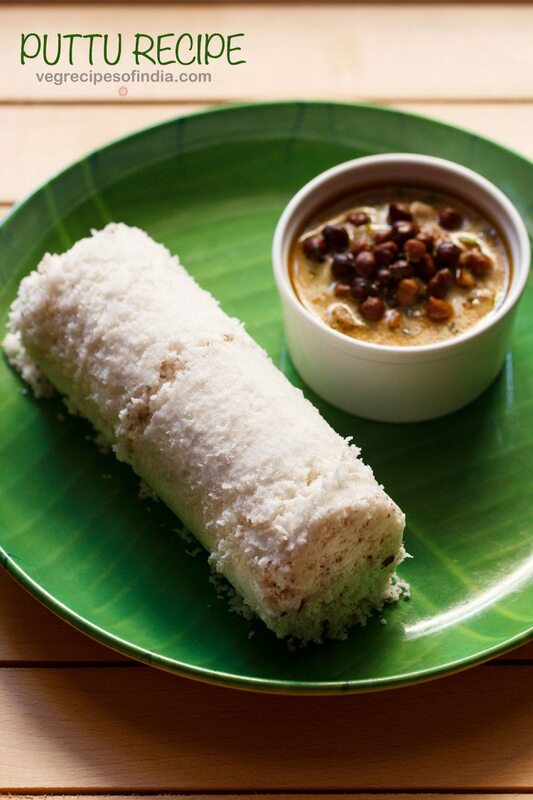 19. serve instant rava dosa with coconut chutney or idli podi or sambar or any chutney of your choice. Love ur recipes. Just one quick question.. Can we use roasted rava ?? Why unroasted ?? Thanks Jismi. Use unroasted rava. The texture with roasted rava will change. roasted rava might make the dosa slightly hard. Thank you Dassana for sharing this recipe. thank you hema for the feedback on butter rava dosa as well as other recipes. happy cooking.